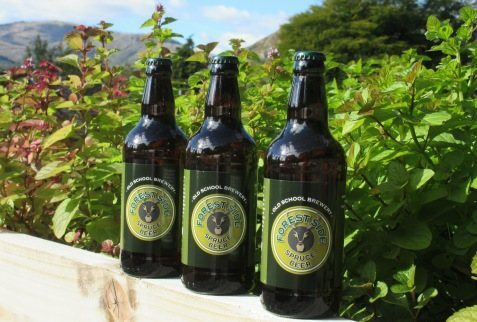 Kevin Tickle, head chef at Andrew Wildsmith’s latest hotel offering The Forest Side, in Grasmere, has teamed up with Ian Walsh from the Old School Brewery, Warton, near Carnforth, to create the perfect winter warmer – Spruce beer. Kevin, a born and bred Cumbrian, has always had a deep seated love for the natural environment around him, something that has been a major influencing factor in his life and has underpinned his career over the years, previously as chief forager and Sous Chef at L’Enclume, Simon Rogan’s flagship restaurant and now in his role at Forest Side. Tickle has over the years experimented with producing small batches of beer, using a wide variety of ingredients from the local surroundings to compliment his food. Kevin got chatting to The Forest Side’s head gardener Catherine Walsh about brewing possibilities the 43 acres of gardens might offer for the Hotel. As luck would have it, Catherine’s other half, Ian, runs his own micro-brewery, The Old School Brewery, Warton, near Carnforth. The brewery has a pretty simple ethos – they use top quality ingredients to create handcrafted beers produced with lots of love and patience, which is why it widely recognised as one of the top breweries in Lancashire. So when Kevin, Catherine and Ian got talking about the brewing possibilities and they soon hit on the idea of making a Spruce beer using young pine needles from trees in the grounds of Forest Side, Hipping Hall and The Ryebeck. Spruce beer may sound a little unusual but they have been about produced in North America and Scandinavia for centuries, indeed it is believed that Native American Indians learned to make Spruce beer after regular contact with Viking settlers. The beers itself can be have vastly different flavours depending on which part of the tree is used, the variety of used or what time of year the crop is harvested from the tree – which can produce everything from floral, citrusy, fruity, resinous, piney or even cola-like flavours. The first batch of 1,200 litres produced by the trio was fermented for five days, brewed in a day and then sent off to be bottled, producing 2,000 bottles, which has been split between Wildsmith Hotels and The Old School Brewery. Now the three are busy talking about other brews they can work up using the huge range of botanicals available to them from The Forest Side’s fully restored kitchen gardens and the grounds at the other two hotels in the group. 2) The Wildsmith Hotels are happy to accommodate press visits for journalists with commissioned pieces, please contact Greg Stephenson by email or on the number above for more details.